Bernadette Farrell was a young hairdresser who lived in Childwall. 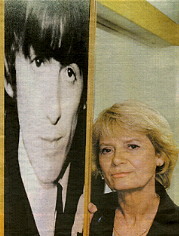 She first saw The Beatles perform in 1961, and when they became a fixture in the Cavern Club she joined their devoted fan following. Two years later when she was 17 years old, their lead guitarist George, who lived very near to her, asked her out by posting a note through her door. "It wasn't too much out of his way to run me home. I still have a little note that he gave me for our first date. It was in early 1963. It was a very happy teenaged period, and I have so many hapy memories." "It was no big, raging love affair, but George was my boyfriend. He was a lovely, lovely man, a caring, private person. A lot of people said he was quiet but that's because they didn't get to know him. He was actually quite lively and humerous. he was always making dry quips. He was not shy, but he was happy to stand back and only speak when he thought it was relevant. He was a deep thinker who didn't say any more than was neccesary." Although George was soon to be known universally as "The Quiet Beatle" Bernadette thought of him in a different way. "He was perhaps a bit quieter when you first met him but as soon as he got to know you he was like most other Liverpudlians, with a wonderful dry sense of humour. He was part of such a happy period of my life and he was a special person." 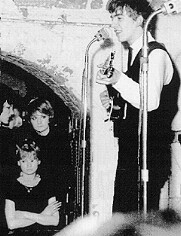 Bernadette was still a Cavern regular and part of the crowd even though she was now going out with a Beatle. "When their first single, 'Love Me Do' came out, a lot of the Cavern fans wouldn't buy it, because they were worried it would make them famous and they would leave." "I still have my copy, signed by George. It must be worth a fortune, but I would never part with it. 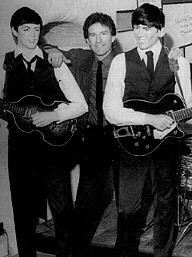 They got their first silver disk for 'Please Please Me', and George brought it to the house to show us. He was very proud. My mum asked him if we could put it on the record player!" 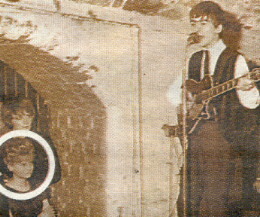 When George was away from home she would spend her time back in The Cavern watching other up-and-coming groups performing. In May of 1963 when George was visiting the Canary Islands, Bernadette was photographed by Merseybeat for their Face Of Beauty series in which they chose pretty girls from the Cavern audience to appear in the music paper. "I thought he was coming back the next day, and I was at home getting all dolled up for him. I was sitting there in those giant hair rollers we would wear in those days. The door went, and my brother marched George into the room looking very bronzed and beautiful. His mum had shown him the Merseybeat, and he took one look at me and said 'So this is the face of beauty'! I was out of my chair and upstairs with a brush in my hair before you could blink." When George's fame started to take him away from her more frequently, the pair amicably decided to break up and Bernadette never held any grudges over his choice to leave her and pursue his career. "It was just a short relationship that ended when he went to London. Some of the girls from the Cavern went off to follow the band, but that was not for me. We drifted apart with the pressure of his work. It was just one of those things. People get stick for leaving Liverpool but in those days it was just something you had to do to succeed. They left Liverpool almost overnight and he just didn't have time to see me. I saw him again at a party in the 1970s and he was still the same handsome, charismatic George." "We have two grown-up children now and we are very happy." Mike was involved with Liverpool's Beatle City museum. When the museum was bought by an American company they went out to Dallas with it, returning to Liverpool and launching the Beatles Story museum in May 1990. Despite being connected with Beatle business in Liverpool, she was never one to boast of her own personal connections. "I am not one of these people who needs to shout about how they used to know one of the Beatles and go into every last detail. All I will say is that me and George were girlfriend and boyfriend and we had a lovely time, but it was not a raging love affair." "I treasure my memories from that time and, like many other people around the world, I am deeply saddened by his death. He was too young to die." "I have shed tears today. I feel as though a very happy part of my life has died with George. I was just priviliged to be so close to him. The Beatles are part of the jigsaw of all our lives, and another piece has got lost. But I know the music will live on, and that is the important thing now." SOURCES: Liverpool Echo, Sunday Mirror, BBC news reports, Beatles Biographies. 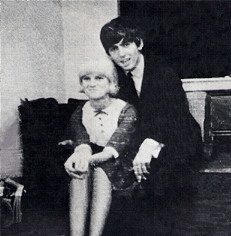 NOTE: According to Bill Harry, writer of Merseybeat, Bernadette also dated Paul McCartney for a short while.